'All About Presentations' by Jazz Factory: 14 Charting Tips: Tip #3 What title should your chart have? 14 Charting Tips: Tip #3 What title should your chart have? This is the 3rd post in the series, 14 Tips to Present Awesome Charts. In the last post I shared with you an easy to use framework which helps you choose the right chart type. Once you have chosen the right chart type and created the chart (in MS PowerPoint or MS Excel) what is the next step? You now need a proper chart title or header. Every chart must have a title which tells the audience what is the chart for. It helps the audience read and understand the chart. Without a title the audience will take longer to make sense of the chart. Try removing the title from a chart you would have presented recently. The audience does take more time to grasp it. Remember that the audience gets only a few seconds to see the chart and make sense of it while you are presenting. Chart A is the actual chart. Chart B has been edited by me (I have removed the chart title). You cannot comprehend anything if I only gave you chart B. It seems commonsensical then to have a descriptive chart title for every chart. 1. Chart title should be descriptive and not too short. 2. It can be composed of two parts; Title & Sub-title. Title is use for the main information and sub-title reveals some extra information. For aesthetics sake, the title can be bold whereas the sub-title a few font smaller without bold. Sub-title to be used only if you have some extra information to share. 3. Chart title should also have the time period mentioned. The year should be written in full. These are no hard and fast rules but only guidelines. It is advisable to have time period in the title. The reason I am sharing it with you is this - When you decide not to put time period in the title, it should be an informed decision. You should not do it out of ignorance (omission). Example 2: The image below contains two charts. The above one is from the Reliance Industries website and the one below from Hindustan Unilever's (block of four bar charts). Observe that the Reliance's chart has a clear header with time period mentioned right beside the title. The Unilever's chart talks of per capita consumption in US Dollars but what time period is it? Try looking for it. It's hidden at the bottom-left corner. 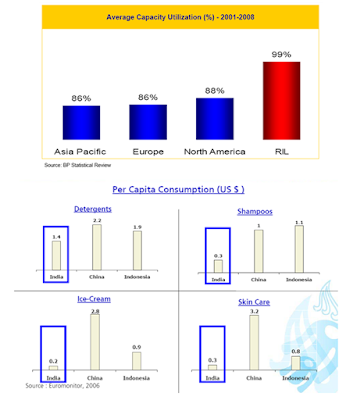 Example 3: Another chart from the same Hindustan Unilever presentation. This pie chart is interesting because it does not even have a title. You can argue that the purpose of the chart is obvious. Break down total turnover into various segments of business. The investor is smart enough. Right? Wrong. You can break down profits and you can break down turnover. How does an investor figure out which one has been broken down here? Here you are subconsciously assuming your audience knows what you know. Hence you omit some information by mistake. Why not put a title always and make life simpler for the audience? 1. Who will decide whether the chart is good or bad? 2. Who stands to lose if the chart fails to fulfill its purpose? The answer to the first is 'the audience' and to the second is 'you'. Your audience decides if your charts are serving their purpose. If you see puzzled looks, be rest assured you have confused them. And who loses out if the chart confuses the audience (who might be a venture capitalist or your boss)? It's you who stands to lose. If your chart is going to be seen by a select audience whose understanding level and background is know to you, then you can take certain freedom. You may go without title or without period and they would be smart enough to comprehend. But when you don't know much about the audience or your audience is very large (say, the whole world in the case of this Hindustan Unilever's presentation) then assuming about the audience would not be the right thing. The book 'Made to Stick' talks about the 'curse of knowledge'. This curse of knowledge explains why your charts have no or incomplete title. It also explains why you forget to label axes in charts and leave your audience puzzled. The curse of knowledge is 'not knowing how it feels not to know something'. Let me explain. If you know advanced algebra or calculus, you can never know how it feels not knowing it. Due to the curse of knowledge, you end up omitting certain information in your charts. Because you have worked on the raw data, created the chart, you are very close to your data. You know it inside out. But your audience is perhaps seeing this chart first time in their life. They are not going to see the raw data also. And they have under a minute to see, understand, analyze and agree/disagree to the point your are making. Given a limited time window, all that you can do to make their life easy is have all the elements of the chart in place. That is why a proper title holds so much importance. If you decide as a rule to use a title always in a chart, you can overcome the curse of knowledge and help your audience grasp your message easily. 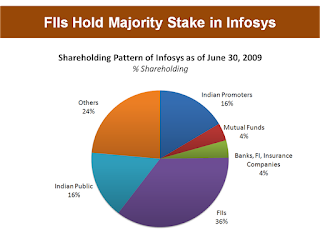 The title clearly explains, that this chart depicts the shareholding pattern of Infosys. It also puts the date right next to the title. You don't need to read the fine print, a small text on some corner of the slide which reads 'as of June 30, 2009'. 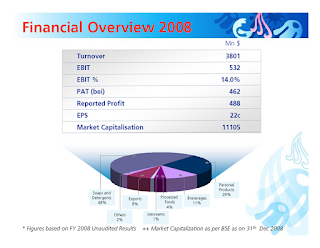 Moreover, the subtitle clarifies that we are looking at % and not absolute number of shares held by each entity. I am sure you are clear on what role chart titles have and how to use them. Now I would like to ask you a couple of questions. Q2. Should you number your charts in a presentation? To share your answers leave a comment. Am waiting to hear what you have to say. See you tomorrow. Disclaimer: Data used in the post is for academic purposes and is not meant to comment on any organization in any manner whatsoever.